To find inmates at the Logan County Jail, click over to the Persons Currently in Custody page. You will need the last name of the inmate to search. The results will give you the booking number, location, date of birth, arrest date and booking date. Look over to the left column and you will see a link "Jail History". Click it and you can see all of the times this person has been in jail detailing the case description, bail amounts and what happened such as release, hold for court, bailed out, etc. 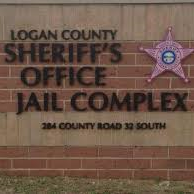 The Logan County Jail was opened in 2000. It has a capacity for 140 inmates. More information about visiting times, rules and inmate mail can be found at the Adult Jail page. Note at the bottom of the page there will be information about video visitation. The Juvenile Detention Center in 2002. It is a maximum security facility which can house 36 juveniles. Go to the CourtView Justice Solutions page to view court records in the public domain by the Common Pleas and Family Courts. Compete the "letters in the box" to prove you are not a robot and you will go to the general search page. A name will yield the case number and type, file date, initiating action, party/company, party type and disposition. Clicking on any of those categories will give you additional information.